Descubre el parque nacional que figura en la lista de la UNESCO con un guía experto. Lo recogeremos en su hotel en Split para comenzar este emocionante viaje de un día fuera de la ciudad. Viaje en un autobús con aire acondicionado durante 3.5 horas mientras aprende sobre la historia y la biodiversidad del parque nacional, que es el más grande y antiguo del país. 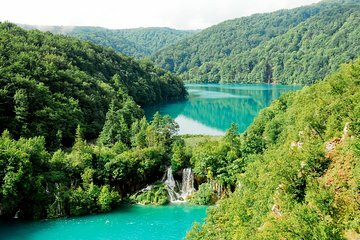 Después de llegar al Parque Nacional de los Lagos de Plitvice, bájese del transbordador y comience a explorar el parque, admirando la diversidad de árboles que hay allí: desde pinos hasta abetos, hayas y los verdes helechos que cubren el suelo del bosque. El sendero puede ser empinado a veces, bajando hasta 300 pasos, pero vale la pena, como verás. La ruta de senderismo cubre una distancia de aproximadamente 1.5 millas (2.4 km), así que asegúrese de llevar zapatos cómodos. Pasee por los senderos, admirando los coloridos pisos silvestres que flanquean su camino y pase por puentes de madera que brindan increíbles fotografías increíbles de los lagos, arroyos y cascadas de color turquesa. Súbete a un bote eléctrico para ver aún mejor los lagos, mientras navegas por el agua clara, cuyo color parece sacado de una tierra de fantasía soñada. Después del paseo, siga caminando a pie mientras se maravilla con las vistas de los lagos más altos. Más tarde, opte por un viaje en autobús o en tren para obtener la vista panorámica final de los lagos y los bosques circundantes. Luego, tome 60 minutos de tiempo libre para explorar un poco más o almorzar (por cuenta propia) en un restaurante, antes de regresar al transbordador para regresar a Split, donde lo dejarán en su hotel. We did this tour on my birthday and what an amazing day, our guide was very knowledgeable and considerate of everyone, we had the local food which was amazing and was nice to go to try the local food. Is well worth paying the extra to be within a smaller group. and we were lucky that the park wasn't very busy so managed to get some amazing photos, I will never forget this place. Amust see. But too much walking on the last part of the tour. Be prepared for a long 3-hr ride each way and crowds. We went on a rainy day and it was cold and wet. Bring an umbrella and warm clothes, -no good rain gear I'm sure it is much nicer on a sunny day when you can stop and admire the waterfalls without jostling am ong the imbrellas. Despite all this, we're glad we went. Definitely a worthwhile experience- gorgeous park w/ amazing waterfalls and tropical colored water! However, if possible I'd highly recommend arranging from a location closer than Split- The 3 hour drive each way is a super long day. Our guide, Iris, was very informative on our drive there but was detached @ park where she was often on her cell phone and unjustly reprimanded a couple different partcipants. Overall, we had a wonderful day walking the trails and were fortunate that the park was not overly crowded as mentioned in other reviews. Nothing to say except that a trip to Croatia that does not include Plitvice Lakes is the a wasted opportunity of monumental proportions. It will be the highlight of your trip. This tour is exceptional and special and a memory I will treasure for my lifetime. Our tour guide was very knowledgable and had the best disposition -- energetic, enthusiastic and very passionate. He knew exactly where to take us to avoid the crowds of the national park, and led us through a great tour of this beautiful area. Be aware that this tour and visit in general requires some hiking including slippery, wet and uneven steps. Our visit was rainy and cold, and it seemed like some people were unprepared for the amount of walking involved note: bring layers for warmth and wear comfortable shoes with a good grip. I was fine in sneakers, but if you're not used to walking on uneven terrain/hiking regularly, something with more grip like a hiking book might be advised. My only critique of the tour itself were the stops made on the drive with 20 minute breaks -- restroom stops on the long drives were appreciated, but I wish they had been quicker in order to get us to the national park and then back sooner. Overall, I highly recommend this trip and tour! Tour start and end times were punctual. We had unexpected bad weather. Our guide was kind enough to take us to the souvenir shop first so we could buy something warm to wear and rain ponchos. Appreciated how flexible our guide was. ie. allowing us to linger at various spots. He also gave good recommendations for best spots to take photos. Was amazed at how well he could keep track of our group amongst a seas of busloads of tourists from larger chartered groups. Overall very amiable disposition and beautiful sites to see. Small group under 18 was a perfect size. Would recommend the trip! What a BEAUTIFUL place!!! Though it rained, more like it poured....we could still tell how truly amazing Plitvice Lakes are. Anna did a great job staying happy and optimistic throughout the wet tour. We were unable to go to the lower lakes due to flooding or take the longer boat ride bummer, but it still is worth the trip! We could definitely do without the stop on the way home for food!! Just tell people to get food at the stop on the way in which I did think was the point anyway. It just makes for WAY too long of a day when adding that stop on the way back when people are tired from the long day and rides almost 4 hours each way!